First came the apricots. From a nearby backyard–their tree had so much fruit that even after picking gallons and gallons, boxes of boxes, there were still More. So I came over, climbed up into their tree, and picked a box (even though I have apricots on my tree, but not surplus like this tree). At the same time, I started Rebecca Solnit’s new book, the Faraway Nearby. Oddly, within the first pages, Solnit talked about her huge score of apricots. She did what I did: raw packed the apricot halves, poured honey syrup over them, then sealed them tight in a water bath, preserving them for a later date. Solnit’s book is about her mother, who had Alzheimer’s. She mentioned the apricots because they came from her mother’s tree. The book is a meditation on how we remember things, and it’s lyrical and beautiful. Apricots are easy. They make sense to preserve–their season is short and sweet, and in the winter a jar of honeyed apricot halves are a taste of that golden season. I quickly worked through my box, and like Solnit I also made jam. I dried some too. But there was another kind of surplus in the garden that I had never much tried to preserve: greens. Tons and tons of greens. Chard. Dino kale. This weird cross between dino kale and red Russian kale. I way way overplanted. When I had the goats, this was not a problem. Goats love greens–they are rich in calcium and taste delicious to the caprine palate. But the goats are gone, and my chickens aren’t that interested. I made a mistake, I realized, and needed to transform the greens before the aphids took over. One. Kale salad. 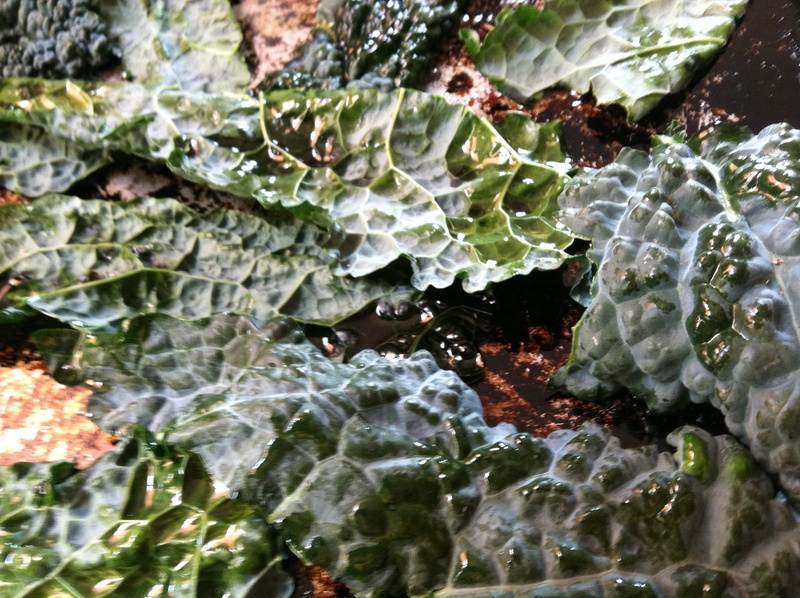 Massage finely cut kale with salt and lemon juice. Eat. Repeat. You’ll feel like a shiny new person. Your bowels will thank you. My oven is old and the pilot light runs really hot. It might be 200 in there. Just as an experiment, I picked a bunch of kale, washed it, stripped out the stem, drizzled the leaves with olive oil, and stuck the pan in the oven. 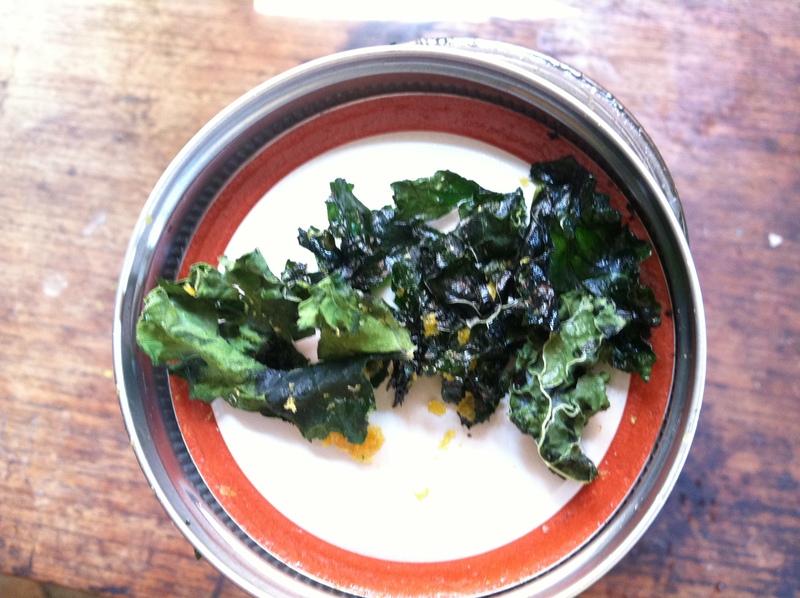 The next morning, the kale was crispy and dessicated. Delicious. I added nutritional yeast (hippie dust) and sea salt. What a great snack for a road trip when I don’t have access to fresh kale. Three. Gundruk*. This is from Sandor Katz’s book Wild Fermentation. You pick kale or greens and let them sit out in the sun. Then you beat them. Then you cram the greens into a jar. Then you put this jar in the sun for a few weeks. What? I thought, that sounds gross. There’s no salt added. I thought for sure it would become an aerobic stinky pile of slim. Oddly, I opened the jar a few days in and it smelled kind of sour, but not rotten. Kind of fresh and green. 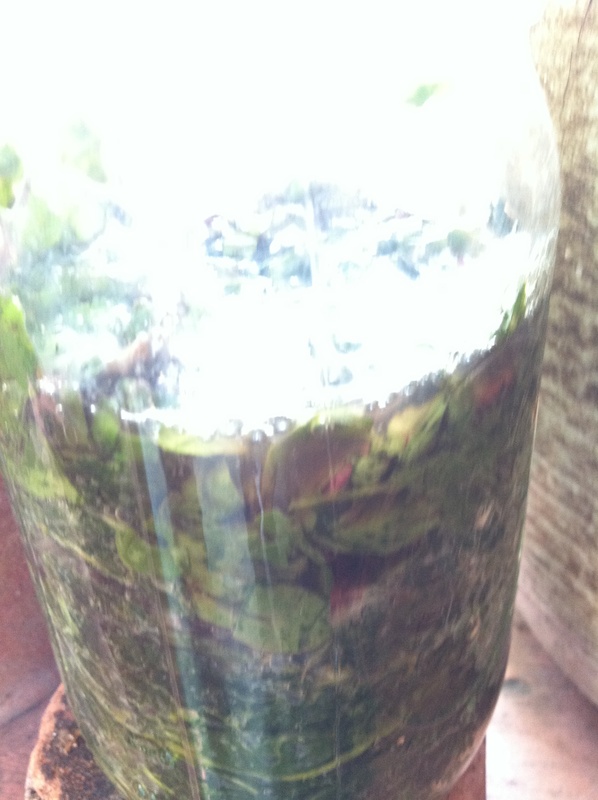 It needs to ferment a bit longer, will give the gundruk update. While I crunched on my kale chips, I recognized how different this process was from the apricot processing. It wasn’t about preserving something–to recall a fond time. It wouldn’t really make sense to try to bottle kale because I can grow greens year round. The chips and the gundruk is about transformation. But then I remembered another part of the Solnit book: she takes the pits of the apricots, puts them in Everclear and lets the concoction steep for several months. When she pours off the alcohol, it’s turned the color of apricots, and tastes wonderful–just like…almonds. *Here’s more about gundruk from the charming nepalese website we all nepal: “Gundruk is fermented green vegetable (leaves). Allow mustard, turnip, radish, cauliflower, etc leaves to wilt for one or two days and then shred (unevenly cut into small pieces). You can use Sometimes roots of the plants too, but not all the plants, raddish or turnip, etc. You can mix roots of radish with the leaves and smashed together. Don’ make it too small while smashing. Put those smashed stuffs into a wooden, earthenware or in glassjar very compressed. Close tightly the mouth of the container. Put it in safe and sunny place. It may be placed in an open place. Don’t check it often. After few days let’s say 3 days check the acidity (sourness), you can know if it is ready from it’s strong smell.